California dominates almond production like Saudi Arabia wishes it dominated oil. More than 80 percent of the almonds consumed on Planet Earth hail from there. Boosted by surging demand from China—overall, 70 percent of the state's output is exported—California's almond groves are expanding. The delicious nut's acreage grew 25 percent between 2006 and 2013. In a previous post, I noted how the almond boom is helping fuel a potentially disastrous water-pumping frenzy in a drought-stricken state. Now comes more unsettling news: California's almond groves are being blamed for a large recent honeybee die-off. What do almond trees have to do with honeybees? It turns out that when you grow almond trees in vast monocrops, pollination from wild insects doesn't do the trick. Each spring, it takes 1.6 million honeybee hives to pollinate the crop—about a million of which must be trucked in from out of state. Altogether, the crop requires the presence of a jaw-dropping 60 percent of the managed honeybees in the entire country, the US Department of Agricultural reports. 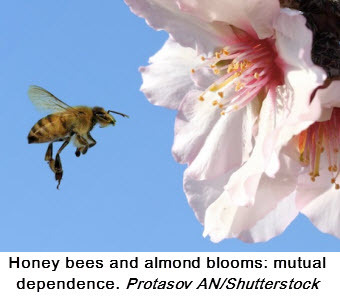 A mutual dependence has arisen between the state's almond growers and the nation's apiaries. For the 1,500 beekeepers who deliver "pollination services" to the almond industry each year, the gig provides 60 percent of their annual income—more lucrative, in other words, than selling the honey they produce, reportsthe Bakersfield Californian, a newspaper in the heart of almond country. "Without the almond industry, the bee industry wouldn't exist," one large-scale beekeeper told the paper in February. But this year, something has gone wrong. 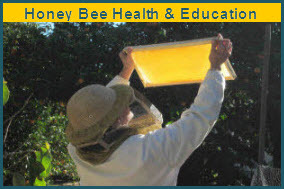 According to the Pollinator Stewardship Council, somewhere between 15 percent and 25 percent of the beehives in almond groves suffered "severe" damage during the bloom, ranging from complete hive collapse to dead and deformed brood (the next generation of bees incubating in the hive). Eric Mussen, a bee expert at the University of California-Davis since 1976, told me that there have been isolated die-offs on recent years, but this year's troubles have been "much more widespread…the worst we've ever seen." The Pollinator Stewardship Council blames the cocktail of pesticides—insecticides and fungicides—almond growers use to keep their crops humming, and Mussen thinks the group may have a point. He told me that several years ago, beekeepers in almond-heavy Glenn County began having problems keeping their brood alive, as well as with developing new queens. They began to fear that the trouble came from a widely used fungicide called Pristine, marketed by the German chemical giant BASF, for almonds. The company, which claims Pristine is harmless to bees, sent representatives to the county to collect almond pollen samples. In them, Mussen told me, they found "significant" levels of an insecticide called diflubenzuron. (Here's a copy of an email from January 2013 that Mussen circulated on the topic.) The catch is that its maker, Chemtura, insists that diflubenzuron, too, is harmless to bees. If the two pesticides are safe for bees on their own, what's the problem? Mussen says that almond growers are combining them along with substances called adjuvants—which are used to enhance the performance of pesticides—and then spraying the resulting cocktail on crops. "It now seems that when you roll these three things together, it has very negative consequences on the bees," Mussen told me. He explained that originally, adjuvants were used to help spread pesticides more evenly. Sprayed on their own, pesticides tend to form into discrete droplets on a plant's leaves that might not come into contact with insects or mold spores. Mixed with adjuvant, pesticides coat leaves evenly, making them more effective. In recent years, the industry has come out with what Mussen calls "super-duper" adjuvants, that not only coat leaves but also penetrate them—which is desirable for growers because it prevents expensive agrichemicals from being washed away by rain or degraded by sun. For bees, though, that development might be bad news. Mussen says it's possible that the bees' own skin tissues had been blocking the pesticides—until the new-and-improved adjuvants gave them a pathway inside. Also, he added, the chemicals "have some pretty potent material in them that we believe could be toxic to honeybees." And while pesticides have to go through a registration process with the Environmental Protection Agency before they can be unleashed upon the world, adjuvants are considered "inert" ingredients and aren't subjected to EPA review, Mussen said. And while the EPA process for assessing the impact of pesticides on honeybees is deeply flawed, as I have shown before, at least there's a process in place. For adjuvants, there's no bee testing at all, he added. And by adding them to pesticide mixes and spraying them on almond trees, farmers aren't breaking any California or USDA rules. It all adds up to yet another pathway linking pesticide cocktails and our beleaguered honeybee population. Pesticides and fungicides widely used in Midwestern corn and soybean fields have been shown to damage bee health—and these operations are also increasingly using adjuvants in their pesticide mixes, too. The above-mentioned PLOS ONE paper concluded that these unregulated chemicals may "contribute to the ongoing global decline in honey bee health." But corn and soybean farmers don't need bees to achieve their harvests. That bee-reliant almond growers would engage in practices that might severely harm bees…well, that's just nuts.